CANADA: Offshore start-up Beothuk Energy is partnering with Copenhagen Infrastructure Partners (CIP) to develop wind farms off the east coast of Canada, starting with the 180MW St. George's Bay project in Newfoundland. The companies will jointly fund the final development of the project, and once a power purchase agreement is in place, CIP will invest all of the capital required to construct the project. "We see significant potential for offshore wind in Atlantic Canada due to strong winds, shallow water and an existing industry with experience in working in an offshore environment for many years," says Christina Grumstrup Sørensen, senior partner at CIP. The St. George’s site is 18km from shore in water depths of 25 metres. Beothuk hopes to generate first power in 2021, but finding an offtake contract, especially in a region expected to be awash in electricity from the 824MW Muskrat Falls hydro project now under construction in Labrador, remains a challenge. 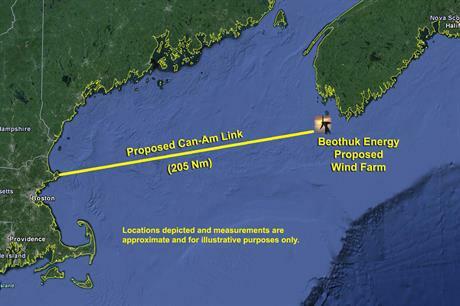 Beothuk has also unveiled plans for a C$4 billion, 1GW offshore wind project off the south-west coast of Nova Scotia, and is developing other projects in New Brunswick and Prince Edward Island.